A friend of mine was riding her scooter through Portland on a nice summer day a couple years back, when out of nowhere an unleashed dog jolts across the street. She swerved to avoid hitting it and dumped the scooter going over 35 mph. The scooter suffered some damage to the plastics and forks, but she was wearing flip-flops, and the skin on both of her feet was gone. Though an unpleasant image, this sort of thing happens all too often. Even on a perfect day, wearing protective gear can literally save your skin. Take these riding boots, for example. 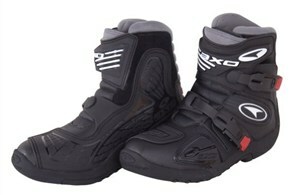 The AXO Slammer II Boots feature PU (Polyurethane, not stinky) coated leather panels and injection-molded construction. This means that they'll last a long time. The heel has a stitched flex panel and molded support to keep your foot in the correct riding position. The buckles are replaceable (just in case), and they're designed to self position themselves for the best fit. The Slammer II Boot has a mesh and synthetic lining and a removable foot bed insert. For someone who doesn't like their boots going all the way up to the calf, the AXO Slammer is a good compromise with good safety features, though they're more of a riding shoe than a boot in my opinion, but they'll still keep all your skin intact. If you want something a little taller for more protection, check out these Frank Thomas boots.